Tyler Erb keeps Brandon Sheppard in check en route to victory. What won the race: After slipping back to fifth early, polesitter Tyler Erb of New Waverly, Texas, rallied to regain the lead on lap 13 and captured the 43rd annual Wrisco Winternationals opener at East Bay Raceway Park. He earned $5,000 for his third career Lucas Oil Late Model Dirt Series victory and second of the season. Key notes: One of the longest-running Georgia-Florida Speedweeks tracks, East Bay hosts six straight nights of Lucas Oil Late Model Dirt Series action for the 43rd annual Wrisco Industries Winternationals. ... Hall of Famer Billy Moyer is the all-time winningest East Bay Speedweeks driver with plans to pilot a Tye Twarog-owned car in his first East Bay appearance since 2015. ... The third-mile oval's surface famously changes throughout the night with tides from the nearby Gulf of Mexico thought to affect conditions. On the move: Don O'Neal of Martinsville, Ind., started ninth and finished fifth. Points chase: After two series points races, Earl Pearson Jr. has 490 points to lead Jonathan Davenport (460) and Tyler Erb (460); East Bay's Monday-Thursday events are non-points races. Dash winner: Billy Moyer Jr.
GIBSONTON, Fla. — Tyler Erb’s chances of grabbing his first career victory at East Bay Raceway Park looked pretty good when the green flag flew Monday evening for the opening night of the 43rd annual Wrisco Winternationals. About 10 seconds later, not so much. The pole-starting driver from New Waverly, Texas, was swallowed by a swarm of challengers on the first lap — third-starting Hudson O’Neal slipped beneath him heading into turn one — and Erb fell back to fourth nearly immediately, dropping to fifth place a few laps later in the 30-lap Lucas Oil Late Model Dirt Series event. Instead of a potential flag-to-flag victory, the new driver for Ohio-based Best Performance Motorsports was simply trying to keep up. With fellow front-row starter Jonathan Davenport out front, Erb steadied himself after a half-dozen laps, regained fourth on the eighth lap and suddenly found himself right back in the mix. Erb regained third on lap 10 — Davenport fell all the way back to fourth — then outdueled Josh Richards and leader Brandon Sheppard, diving under Sheppard in turn two on the 13th lap and then pulling away to a comfortable lead by the halfway point. Erb kept Sheppard and Richards at bay the rest of the way and captured his second Lucas Oil Series victory of the season and first-ever at East Bay. Richards, of Shinnston, W.Va., ran among the top three virtually all the way — leading the ninth lap — and finished second while Sheppard, the New Berlin, Ill., driver who led laps 10-12, was third. Austin Hubbard of Seaford, Del., and ninth-starting Don O’Neal of Martinsville, Ind., rounded out the top five on a night when 53 cars entered, the highest opening-night car count at East Bay in eight seasons. Erb couldn’t be more excited to continue his success for his new Eric Brock-owned team along with crew members Randall Edwards and Colbey Richman. Richards, who never held the same position more than six laps, took second from Sheppard with four laps remaining but couldn’t track down Erb. Sheppard, who started fourth and, like Erb, slipped back a few spots early, was glad to have a good racing surface. The feature lasted barely 12 minutes and was slowed by a single caution on the first attempted start, when Jimmy Owens got sideways in turn one, collecting Tyler Carpenter and necessitating a complete restart. Notes: Erb had a 0.918-second margin on Richards at the checkers. ... The top seven finishers were driving Rocket Chassis. … Seventeen of 26 starters completed 30 laps. … The checkers fell on the feature at 9:04 p.m. ... Scott Bloomquist retired after eight laps. ... Billy Moyer finished sixth in fielding the Tye Twarog-owned Rocket. Row 9: Joey Moriarty, Dennis Erb Jr.
Row 13: Tanner English, Billy Moyer Jr. The six heat winners are a study in contrasts in terms of past Winternationals success. While Tyler Erb, Hudson O’Neal and Chase Junghans have never won at East Bay, the other three victors own a combined 14 triumphs in the miniseries: Josh Richards (seven), Jonathan Davenport (four) and Brandon Sheppard (three). … The polesitting Erb fueled up for his bid to reach victory lane for the first time at East Bay by making a quick run through the Lucas Oil Series operations trailer to pick up a package of chewy fruity snacks. … Austin Hubbard of Seaford, Del., starts seventh in a late-2016-vintage XR1 Rocket that he didn’t enter in a race last year. It was sitting in his shop as the new year approached when he decided to put it together for the Winternationals. “We had it on a jig at Rocket on Jan. 4 to get looked over and on Jan. 5 it was a bare frame in the shop,” said Hubbard, who ran the machine in the 2017 Winternationals. … Brian Shirley of Chatham, Ill., landed a berth in the 30-lap feature thanks to a fast-time provisional, but he let an opportunity for a prime starting spot in the headliner slip through his fingers. He slipped back to third from the pole at the start of his heat and then slid sideways and killed his car’s engine between turns three and four as he regained momentum and challenged for second place. Making his first start since flipping wildly Saturday afternoon at Golden Isles Speedway, he conceded that he was hampered at the initial green flag by the “mental game” a driver faces when trying to jump right back up into the fray after a hard crash and the adjustment he had to make to running his backup car, which he said “feels different” than the sidelined mount he campaigned most of the 2018 season. … Devin Gilpin of Columbus, Ind., was sidelined for the night while running third in Heat 5 because the keyway stripped off the power steering and fuel pump, causing his Jim Beeman-owned MasterSbilt car’s fuel pressure to drop. He said the problem didn’t hurt the engine. … Tim Dohm of Cross Lanes, W.Va., was an early retiree from his heat with engine trouble. A crewman speculated that it might have been a broken rocker arm, but the team will determine the cause Tuesday when they tear down the powerplant. 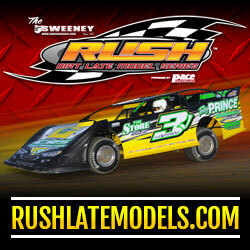 Finish (winner transfers): Billy Moyer Jr., Allen Murray, Devin Dixon, Justin Williams, Jeff Mathews, Dan Stone, Rusty Schlenk, Vic Hill, Blair Nothdurft, John Tweed, Zack Dohm, Colton Horner, Joel Callahan, Kerry King, Ryan King, Chuck Hummer. First consolation (top two transfer): Tim McCreadie, Stormy Scott, Billy Moyer Jr., Ryan King, Allen Murray, Tanner English, Dan Stone, Justin Williams, Joel Callahan, Dan Stone, Matt Cosner, Zack Dohm, Blake Spencer, Chuck Hummer, Bob Geiger, Colton Flinner, Terry Casey. Scratched: Jonathan Rowan, Tim Dohm. Second consolation (top two transfer): Brandon Overton, Tyler Carpenter, Earl Pearson Jr., Colton Horner, Devin Dixon, Brian Shirley, Jeff Mathews, Blair Nothdurft, Vic Hill, Rusty Schlenk, Kerry King, Mike Benedum, John Tweed, Shanon Buckingham, Morgan Bagley, Joe Denby. Scratched: Devin Gilpin. Row 3: Devin Dixon, Earl Pearson Jr.
Polesitter Chase Junghans raced to a victory in the final heat, pulling away from Lucas Oil points leader Earl Pearson Jr. mid-race and cruising to victory. Jimmy Owens raced between Pearson and Dennis Erb Jr. on the frontstretch to grab second on the sixth lap, and nipped Erb for the second spot as they battled over the final laps. Pearson faded to finish fifth behind Tyler Carpenter in the caution free prelim. Finish (top three transfer): Chase Junghans, Jimmy Owens, Dennis Erb Jr., Tyler Carpenter, Earl Pearson Jr., Vic Hill, Mike Benedum, John Tweed. Polesitter Brandon Sheppard cruised to a 10-lap victory in the fifth heat. Gregg Satterlee transferred in second, regaining the spot from third-finishing Freddie Carpenter on the final lap. Devin Gilpin had third through the first six laps, but he slowed to draw a lap-seven caution and pulled pitside. A third-lap yellow appeared when Blair Nothdurft spun in turn four while Joe Denby spun in turn two. Finish (top four transfer): Brandon Sheppard, Gregg Satterlee, Freddie Carpenter, Jeff Mathews, Devin Dixon, Blair Nothdurft, Shanon Buckingham, Joe Denby, Devin Gilpin. Polesitter Brian Shirley's first-lap struggles on the backstretch allowed Jonathan Davenport and Scott Bloomquist past, and Davenport took advantage to grab the victory. Devin Moran stole second from Bloomquist on a mid-race restart, and Bloomquist held off a late charge from Brandon Overton to finish third. A rallying Shirley spun in turn four on the fifth lap while trying a groove-swapping dive under Bloomquist, drawing a yellow; Shirley finished sixth. Finish (top four transfer): Jonathan Davenport, Devin Moran, Scott Bloomquist, Brandon Overton, Colton Horner, Brian Shirley, Morgan Bagley, Rusty Schlenk, Kerry King. Josh Richards outumped polesitter Billy Moyer and raced to a 10-lap victory. Moyer pressured him late and transferred in the second spot and eighth-starting Joey Moriarty transferred in third. The first attempted start was called back and the second start scrapped when Jonathan Rowan spun in turn two and collected Justin Williams. Rowan and Tim Dohm retired before a lap was complete. A third yellow appeared for Justin Williams, who spun after Flinner knocked him out of the way in turn three to take the third spot. Officials tagged Flinner with rough driving; he had to restart on the tail and ended up sixth. Finish (top four transfer): Josh Richards, Billy Moyer, Joey Moriarty, Justin Williams, Ryan King, Colton Flinner, Bob Geiger, Tim Dohm, Jonathan Rowan. Hudson O'Neal led all the way from the pole, racing to a 10-lap victory over his father Don O'Neal, who survived a scrape with outside front-row starter Tanner English on the third lap. Jason Jameson, who ran second early but lost the spot to the elder O'Neal, fought off Stormy Scott for the final transfer spot. A lap-two caution appeared for Joel Callahan's turn-two spin and again for English's turn-four spin a lap later after Don O'Neal went past. Finish (top four transfer): Hudson O'Neal, Don O'Neal, Jason Jameson, Stormy Scott, Allen Murray, Blake Spencer, Tanner English, Joel Callahan, Chuck Hummer. Tyler Erb overtook polesitter Kyle Bronson on the fourth lap and cruised the rest of the first 10-lapper. Austin Hubbard dropped Bronson to third two laps later to grab second, while Bronson held on for the third and final transfer spot over Billy Moyer Jr. Finish (top three transfer): Tyler Erb, Austin Hubbard, Kyle Bronson, Billy Moyer Jr., Zack Dohm, Tim McCreadie, Matt Cosner, Terry Casey, Dan Stone. Row 1: Chase Junghans, Dennis Erb Jr. Rebounding from his violent barrel-rolling crash Saturday at Golden Isles Speedway, Brian Shirley of Chatham Ill., set fast time Monday at East Bay Raceway Park in the opening round of the 43rd annual Wrisco Winternationals. Shirley steered his backup car to a lap of 14.996 seconds on the third-mile oval to earn the pole position for the fourth of six heat races at the six-race miniseries for Lucas Oil Late Model Dirt Series competitors. Other heat race polesitters: Kyle Bronson of Brandon, Fla.; Hudson O’Neal of Martinsville, Ind. ; Billy Moyer of Batesville, Ark. ; Brandon Sheppard of New Berlin, Ill.; and Chase Junghans of Manhattan, Kan. The top three finishers in each of six heats will transfer to the 30-lap main event. The 43rd annual Wrisco Winternationals kicks off with a 53-car field, one short of the top car count for the week one year ago and the biggest first-night car count since 2011. A handful of others — including Austin Rettig, Chad Stapleton, Greg Oakes and Austin Burns — are on the grounds but not entering the opener. Michael Lake's Bobby Lake Motorsports team is also apparently on the way to begin competition Tuesday. … Tim Dohm of Cross Lanes, W.Va., is back making his annual appearance in East Bay’s action, but this year he’s joined in the field by his son Zack, whose only previous Winternationals start came two years ago when he won a heat race but faded quickly in the feature. Both Dohms are racing this evening but they’re uncertain if they’ll do a two-car assault every night. … Brian Shirley of Chatham, Ill., is ready for action after riding out a wild series of flips in Saturday afternoon’s Lucas Oil feature at Golden Isles Speedway near Brunswick, Ga. While he’s in his backup Bob Cullen-owned car because the machine he crashed is tucked away in his hauler awaiting possible frame repair at Rocket Chassis, the reigning DIRTcar Summer Nationals champion said he’s feeling surprisingly good physically after the wreck and is confident he can compete for wins this week. … Billy Moyer of Batesville, Ark., the 61-year-old Hall of Famer who is the all-time winningest driver in Winternationals competition, is set to make his first start since 2015 at East Bay (and Speedweeks in general) behind the wheel of Ohioan Tye Twarog’s No. 9. It will apparently mark the first appearance for Moyer in a mount not carrying his familiar No. 21 since 2004, when he piloted David Turner’s No. 15 in Arizona’s winter action. … Devin Gilpin of Columbus, Ind., has a new rear end in his Jim Beeman-owned MasterSbilt mount after mechanical trouble left him a non-qualifier in Saturday night’s Lucas Oil feature at Golden Isles. … Legendary chassis builder C.J. Rayburn is in the pit area socializing with friends and offering assistance to his house car driver Rusty Schlenk of McClure, Ohio, who made the decision to haul south for the Winternationals in late January. … Another veteran chassis builder making a rare racetrack visit is Warrior’s Sanford Goddard, who turned the reins of his Tennessee business over to Mike Nuchols in the fall. Goddard, who didn’t attend a race in 2018, is helping Nuchols and Warrior house car driver Ryan King. … First-time Winternationals entrant Colton Horner of Katy, Texas, who turned 16 last Thursday, has a Cornett engine under the hood of his car after hurting a powerplant at Golden Isles. The team arranged to pick up a Cornett motor at racer Ahnna Parkhurst’s shop in Georgia and pulled an all-nighter to install it for Monday’s program. … It’s a festive night in the Rocket Chassis house car camp as the team’s youngest crew member, Joel Rogers, is celebrating his 21st birthday. … Making his 39th Winternationals appearance is Bob Geiger, a soon-to-be 67-year-old who thought last year’s miniseries might be his last as a driver but decided to make a return to run the Clay by the Bay. Action is set to begin Monday for a big week of Lucas Oil Late Model Dirt Series action at East Bay Raceway Park with the first round of the 43rd annual Wrisco Industries Winternationals. Home-state driver and four-time series champion Earl Pearson Jr. of Jacksonville, Fla., leads the tour to East Bay after season-opening first- and second-place finishes Saturday at Golden Isles Speedway’s RhinoAg Super Bowl of Racing. Other drivers expected include home-track driver Kyle Bronson of nearby Brandon, Fla., winner of last year’s Winternational finale, along with two-time 2018 winners Brandon Sheppard of New Berlin, Ill., and Jonathan Davenport of Blairsville, Ga., the reigning series champion. With Super Late Models the only division competing, each night’s field will be split into two groups for time trials followed by six heat races, two consolation races and the feature event. Monday’s 30-lapper pays $5,000-to-win in a non-points race. Two series provisionals will be among a 26-car field along with a fast-time provisional and Strawberry Dash winner. Row 13: English, Moyer Jr.